Certain people (you can call them rewinders) have the ability to travel back in time (the rewind power). First she activates her power. The activation is a purely mental action. It takes negligible time, and can be done reflexively if she is mentally prepared. She then selects a point in the past. You can regard this selection as happening instantaneously. The selection is quite accurate: a novice rewinder can control the amount of time rewound to within around 10%, and some practice will improve this to 1% or better. At this point, the physical state of the universe is rewound, set back exactly as it was at the chosen moment. Nothing is special: even the rewinder's body returns to the position and condition she was in at that moment. However, crucially, the rewinder retains her memories of the possible future she experienced (the period between the current moment and the moment she activated her power). The length of time that can be rewound is limited by a sort of mental stamina. For this question, assume that each rewinder has around two minutes of stamina. A rewind uses an amount of stamina equal to the amount of time rewound, plus around a second of overhead. A rewinder's stamina recovers in realtime. That is, she regains one minute of stamina for every minute that elapses. If, at any point, a rewinder's experience in the present differs from their experience in a previous "possible future", she regains her memory of that alternate future. Recall of a possible future is only triggered by differences that she could notice. For example, if a page of text was worded differently in a possible future, she would need to read the text to trigger recall, simply looking at the page would not be enough. The rewinder's brain gives precedence to recall of possible futures that are more important to the rewinder. At this point, some examples are in order. Alice and Bob are eating lunch on opposite sides of the break room. Bob has his back turned to Alice. Alice knocks her cup off the table, which Bob does not hear. Before it hits the floor, she rewinds thirty seconds. This time she moves her cup away from the edge of the table, and eats her lunch for the remainder of the thirty seconds. Since Bob is/was looking the other way, he will remain unaware that a rewind happened. 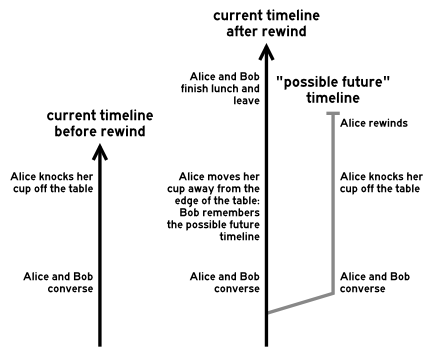 Same as above, except this time after rewinding, Alice picks up the cup and throws it in the trash next to Bob. As soon a Bob notices Alice throwing away the cup, he remembers the possible future where Alice does not throw away the cup. However, since Alice rewound before the cup shattered on the floor, Bob is unaware that Alice knocked the cup off the table in the possible future. This example is posted as an answer due to its length (this question is already long enough). I've tried to include every mechanic that people have asked about, so be sure to take a glance. How would a rewinder use her power in hand-to-hand or close-quarters combat against another rewinder? Both strategies and examples are OK. You may consider the case where she initially does or does not know that her opponent is also a rewinder. You can discuss how she would recognize that her opponent is rewinding, or how she would conceal her rewinds from her opponent. This mostly covers non-stealth attacks, in the idea of military combat or an arena fighting match. Neil better covers stealth, which would likely be the way all rewinders prefer to fight. Editted to readdress the OP's question. The rewinder with the most mental stamina would win every fight. For example, Bob would slash at Alice with a knife, then Alice would rewind in order to block/parry, then Bob would rewind to change his attack. These exchanges would continue until both parties are out of mental stamina. This means that stamina would act like "a shield", meaning you would want to preserve it. After all mental stamina is gone, the combatants would start taking real damage, and possibly be killed or beaten. Because of this, combatants would most likely allow attacks to land before rewinding, to see how lethal they are, and decide whether they want to waste stamina for a little pain or if they really do need their arm back. This would pose an advantage for poison wielders. If the poison can stop the defender from rewinding all together, than any attack would be a huge benefit. After the shield/stamina is gone, it is either whoever can endure the most pain and still fight, or who has the most skill. When exchanging in a gun fight, it would be more difficult to see the threats coming, meaning the rewinders would not be able to rewind before the attack hits them, but rather after. When Bob snipes Alice, she would rewind after there's a bullet in her shoulder, unless she can magically see the bullet. However, in anticipation of being hit, if there is enough distance between the attackers, the defender could rewind as soon as they hear a gun shot. This would potentially save them from being killed or knocked unconscious, so it would be the best move. However, this would lower stamina, making it a risk; if the bullet would have missed, the defender still wasted stamina rewinding. This means whoever fires more bullets would likely win. In ranged combat, the attacker has the advantage of surprise, because the defender is unable to see the attack and react fast enough. However, in this case both parties are very equal. If a shot is lethal, brain or heart wound, it can either instantly kill the defender or prevent them from rewinding. Overall melee fights of equal stamina would result in an ordinary knife fight, except there is a bit more strategy with which hits to take and which to avoid. A gun fight would result in both parties spamming their guns, wasting all their stamina, and then it would be a normal gun fight. I'm answering my own question to add an in-depth example. Very in-depth. Grab yourself a cup of coffee because this is going to be a long one. Eve, a rewinder, has turned to a life of crime. So far, she has been quite successful at committing a huge number of petty crimes; after all, learning to pickpocket people is easy if you can hit undo anytime you get caught! She believes herself to be the only person with the rewind power. Today she is waiting in an alleyway, getting ready to relieve the next passerby of their wallet. A man starts to take a shortcut through the alley. Eve stays in the shadows until he gets near, then she steps out and points her gun (a .38 special she stole from her fence) at him. As he raises his hands, Eve demands his money. He slowly reaches into his jacket, but to Eve's surprise, instead of his wallet he takes out his own concealed weapon: a subcompact Glock 26 with custom-molded grips. Startled, Eve quickly rewinds to just before the man entered the alleyway. A man starts to take a shortcut through the alley. Eve starts as she jumps back into her body, but manages remains silent. She stays in the shadows, watching him closely. She thinks back and remembers that his gun was quite expensive, and notices his stylish, well-fitting clothes. She thinks that he's probably carrying a lot of cash; but if he's not, watch alone will fetch her a couple hundred dollars: not to mention the gun, which is worth at least 500. In either case it's worth another try. She waits until he gets near, then she steps out and points her gun at him. As he raises his hands, Eve demands his money. He slowly reaches toward his jacket, but Eve stops him and pulls out his handgun. This is her first mistake. Bob is taking a shortcut through the alley. He jumps back mid-stride, but doesn't miss a step. Eve stays in the shadows, watching him closely. She begins to notice that something is wrong when he begins to speed up. Confused, she begins to remember taking his gun. Bob pulls out his gun and levels it at Eve. She knows this is not what happens, and begins to put it together: he might have the rewind power too. Bob maneuvers himself to block Eve from escaping and says, "Don't try anything. I know what you are, and what you can do. Just—"
Before he can finish his sentence, Eve rewinds. Now in a state of panic, she goes back further than before. Eve starts again as she jumps back into her body. She checks the end of the alleyway and sees that Bob has not yet entered. Her mind racing, and her body kicking into fight-or-flight mode, she jumps to the conclusion that she has to take care of Bob before he can do anything else. She steadies herself against a stack of pallets as she takes aim at the end of the alley. Bob starts to take a shortcut through the alley. Just as he turns the corner, Eve shoots. The best shot she's ever made, it hits Bob right in his head, killing him instantly. 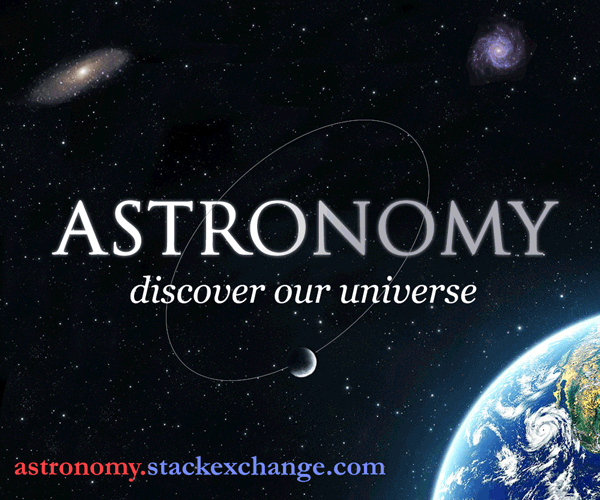 Eve starts to step backward. Dropping the revolver, she looks at her hands as the realization of what she has done begins to sink in. As she begins to run, she hears screams from the street. Eve realizes that she has made the wrong choice, and braces herself to rewind as far as she can. Eve staggers as she jumps back. Her head pounds and spots swim in her eyes: she's hit the limit of how far she can rewind. She turns and runs out the other side of the alley, trying to put as much distance between herself and her mistakes as possible. Bob starts to take a shortcut through the alley. Just as he turns the corner, his memory is triggered: he remembers a young woman, another rewinder, trying to hold him up. He also realizes that he dies right now in one of the previous timelines. He looks up and sees Eve fleeing the alley, and realizes he has to stop her. He rewinds back as far as he can. Nearly tripping as he jumps back into his body in the middle of a crosswalk, Bob breaks into a run. He needs to get to the other side of the alley in under two minutes. Fortunately he's fairly fit, and makes it around the block with seconds to spare. This time Bob doesn't stop as he reaches the corner, but continues at full speed down the alleyway. He sees Eve jump back, and as she turns he slams into her, sending her sprawling to the ground. Eve takes one frightened look down the barrel of Bob's gun and tries to rewind. Eve can jump back just far enough to get tackled again. Bob shakes his head. "I saw that, and I know you're spent—you can't get out of this one." "Who are you? And what just.. what did... what happened?" Eve blinks her eyes in confusion. Bob slides his gun back into its holster, and extends his hand toward Eve. "Come with me and I'll explain it to you. I'm guessing you've never met another rewinder before?" Eve grabbed his outstretched hand to pull herself up, thinking, "rewinder—so that's what I am..."
The Roman numerals refer to the timeline number in the text. Blue objects refer to Bob, and red objects refer to Eve. Don't worry too much about the exact timings: I had to fuzz them a little to get everything to work out the way I wanted. This is the model that I use internally (i.e. in my head) when I'm thinking about rewinding time-travel. Essentially, time flows horizontally from left-to-right. Whenever someone rewinds, the timeline ends, and a new timeline splits off from the point they rewound from. The new timeline is one layer down horizontally, so that overall progress is left-to-right, top-to-bottom like English text. The person who suggested this view to me called it the "garden-path" model. The layout is the same as before (and the horizontal positions are the same), but the branch connections have been removed, and lines have been drawn from each rewind to the timeline that rewind starts. This forces you to follow the diagram in the same order as the text. The numbers represent the amount of stamina each reminder has remaining (in minutes and seconds). They occur at the beginning and end of each timeline, or wherever there is a discontinuity (like a rewind). The diamonds represent when a recall is triggered. The dashed line connects the current timeline to the previous timeline where the rewinder's perception differs from the current timeline. 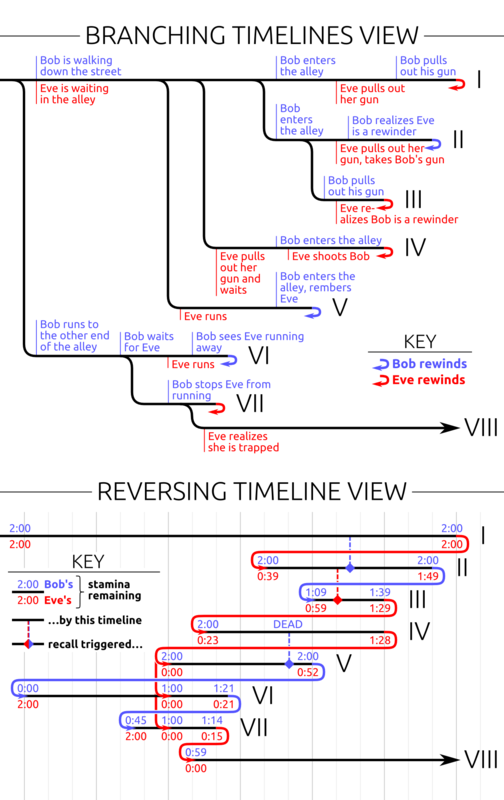 For example, the line from timelines I to II represents where Bob sees Eve pull her gun in timeline I, but take his gun in timeline II: thus he experiences a recall in timeline II. When rewinding, the rewinder looses an amount of stamina equal to the amount of time she rewound (plus a little overhead). If we say that stamina can never be negative, this is what enforces the "two-minute limit." We can see this, for example, when Eve rewinds from timeline I to timeline II: she loses 1:21 of stamina, but Bob loses none. If a rewinder has fewer than two minutes of stamina, her amount increases by one second per second. For example, at the end of timeline II Eve has gained 1:10 of stamina, putting her total at 1:49; or at the beginning of timeline III, 0:20 after Eve dropped to 0:39, she has gained 0:20 (for a total of 0:59). If a rewinder's recall is triggered by a rewind from the previous timeline, the rewinder loses stamina as if she had rewound to the current timeline. This is what occurs in timelines VI and VII: Eve drops from 2:00 to 0:00 since, as far as she knows, she has just completed an ordinary rewind back. She rewinds further than she needs to. Not only does this deplete her stamina early in the timeline, but it also creates more chances for Bob to get a recall: possibly giving him enough time to react without rewinding himself. She doesn't realize that she can't erase the previous timelines. The only way to catch your opponent unaware is to rewind further back. He lets Eve do the rewinding. By letting her "leapfrog" over his earliest rewind, he effectively regains all of his stamina, while hers is depleted. This would probably be a key element in a general strategy. This is helped by the fact that he rewinds in very short intervals, to just before the points where he needs to change his actions. He avoids triggering Eve to recall, for example in timeline VII where he waits until after Eve jumps back to reveal himself. This prevents her from being able to leapfrog over him. If Eve had not rewound after killing Bob, he would have been dead permanently. She has actually used one of the surefire ways to beat a rewinder, which is to totally incapacitate him (by death or unconsciousness) before he can rewind. There is a time limit to a battle between rewinders. Although "leapfrogging" allows rewinders to travel further than two minutes into the past, Eve and Bob are barely within two minutes' running distance at the earliest time Bob rewinds too, so rewinding further would only put them farther apart (a plus for Eve, but not for Bob). I may also consider adding a condition that a rewinder can only recall memories from up to two minutes in the future. This would mean that even if a group of rewinders set up a situation where they could repeatedly leapfrog back to when they set up, they'd have to play a game of telephone two minutes at a time. To rewind back an hour they'd have to make forty to fifty jumps, so only a very simple message would make it back un-corrupted. Bob appears to be very good at handling the discontinuity of perception one experiences during a rewind. (Imagine your body instantly changing to a new position: without a lot of practice, you'd likely lose your balance before your brain could realize what's going on.) This is one way that experience will have a big effect in combat performance, especially if all rewinders always have the same stamina cap. There are a couple ways to ease the transition. For example, a sniper who's lying down in the same position will find the jump fairly easy; or if a rewinder wants to jump back to a point where he's running, he might take one or two steps first, and jump back into the same part of his gait (although this by itself will take a lot of skill in "targeting" the right time to jump back to). I hope this gives you guys some more ideas to think about! Thanks for all your help in refining this example. I agree with Xos Mel's post, though I would add that knocking out or shooting your opponent in the head would be the key objective, because only then would the fight end and you'd win. So any fighter with sufficient experience fighting against rewinders would likely focus on this style of fighting. More likely still, they wouldn't be good fighters, simply very good at stealth, since if you can make the first strike against your opponent knocking them out, they can't retaliate by rewinding. You would probably prefer knocking out your opponent to shooting them in the head, since that gives away your position. Rewinding would come in handy in stealth, since if you're caught in the open when someone is turning around, you can simply rewind to a point where you were hidden and try a different route. You would simply have to do so before your enemy realizes that you're a threat. In that regard, it might be very advantageous to dress as the enemy, since that provides more time of confusion in your opponent to prevent them from realizing you're the enemy and should thus rewind. However, if a mistake like that were made, you would backtrack and try a different route, yet your opponent would realize that you rewinded and would expect you, and then stealth is no longer an option. It might even be deadly since you wouldn't know that your opponent knows. That said, to someone who isn't a rewinder, you would literally be like a ninja, unseen and lethal. Those familiar with these types of people would counter most likely with alarms, so that other rewinders can know ahead of time and rewind. If the memories of a rewind happening burst in suddenly then it might be useful as a sort of quick stun. An attacker could intentionally rewind 10 seconds hundreds of times, creating a hundred false memories of possible futures where she slaps, compliments, punches, kisses, trips, throws hot coffee, etc. At some point she commits to the real action. Depending on how the memory effect works, it might take a more experienced rewinder to be able to quickly figure out what is actually going on. A twist on this I just thought of is if the rewinder has an accomplice. She can give directions over a radio or phone while staying out of sight. Each rewind her accomplice does a different thing. That might even convince the target that the accomplice is the actual rewinder since she's the one showing up in the false memories. At some point during the fight, someone would decide to rewind the fight in order to improve the outcome of a maneuver/defense. In doing so, they would be gain the ability to devastate their opponent. At this point, Their opponent would decide to do the same, and rewind time further in order to regain the advantage. As this went on, the one who had the most stamina would win with a sudden devastation attach against a mentally foggy opponent. To onlookers, it would be a single, quick, brutal and precise attack. However, if each had a high amount of stamina, they would eventually rewind to a point before the fight. This would allow them to try and "flank" their opponent, or run away. In the moments before the fight, they would try to find their opponent and get into a good tactical position. Their opponent would try to do the same. It's a good bet that someone would be more interested in running away. If both were hell-bent on killing each other, or they were trapped together for an extended amount of time before the fight, the best idea would be to try to trick the opponent into wasting their ability, or tricking them into thinking that you had wasted yours. If you were stalking a rewinder, you should resolve to follow them closely with a gun pointed at them for an hour before you attack them. As soon as they turn around frantically, shoot them. This moment will be the last (first?) moment that they were able to travel back to, in an attempt to evade you. Afterwards, it would be safe to assume that they had already rewinded several times, exhausting their power, and that you had probably shot them repeatedly in several different non-future moments. edit: If they managed to over exert themselves in their attempt to travel back to evade you, then they would simply (and suddenly) fall over into a coma, making your job easy. 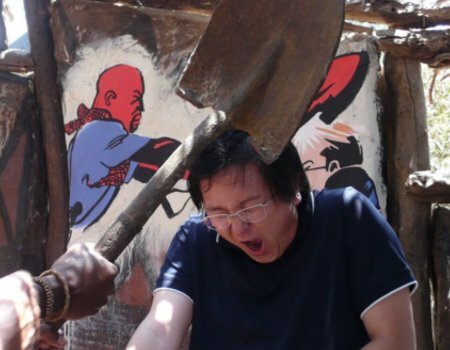 This is very similar to that scene in Heroes, where Hiro gets hit repeatedly with the shovel by Usutu. The best way to kill a rewinder (if that is the goal of the combat) is with a sudden and unforeseen attack. I imagine an assassin with a silenced sniper - The bullet hits another rewinder - but it isn't an immediate death shot. The assassin reflexively rewinds to readjust his aim, which likely happens before the victim realizes what is happening and is able to rewind. The assassin gets another free shot, which the victim won't remember until they are hit again, but this time they are already dead.. In close combat you would want to aim for the same. It could be a lot of feinting and positioning. They are aiming for that one blow that incapacitates their opponent, while trying to keep from using too many rewinds. Alice and Bob circle each other warily.. Bob moves just slightly closer, and manages to kick Alice's leg and make her go off-balance.. Knowing the next blow would be to her head she is forced to rewind.. and steps back just a little when Bob moves closer. The alternative is to rewind to Bob's kick, and plan on either blocking it or counter-attacking. Bob, being intelligent, remembers his kick connecting and can probably makes some guesses what she would do to counter him, I would say Bob still has the advantage in this situation - though Alice could still turn it around. The problem is, if she reaches a better position, Bob can rewind to where he had the advantage. It would generally be best to rewind to a time when you were in a better position or, if that's not possible, when neither person had an advantageous position. To the normal watcher, it may seem like an incredibly long stand-off that eventually ends very quickly. This may not be helpful, but Michael Flynn wrote a great short story (novella, really) called The Forest of Time. It was based on the actions of only one guy who traveled back in time, did something, then tried to go forward to his original time, finding that it didn't exist any more. He kept bouncing around trying to fix it, causing a bunch of chaos. Also, Daniel Keys Moran mentions the concept of "The Time Wars" in his Continuing Time series of novels, which supposedly ended 62,000 years before the birth of Christ. However in the opening chapter of the first novel, Emerald Eyes, set in 2025 or thereabouts, one character enters the scene "from the fast end of time" while being pursued by another character, both of whom are locked in an ongoing battle in these "time wars". In another of DKM's novels, The Armageddon Blues, which is not part of the CT series, the protagonist travels back in time to stop World War III. She is pursued by her mother, who is trying to stop her, because without the war, they would have never existed. Or something. Anyway, a good two-time-traveler story there as well. None of these scenarios directly address your question(s), however they may give you some ideas about what you want to do. The focus of the combat is knocking out the opponent before you are knocked out. Combat should be avoided until the situation can be set up where all paths will lead to a win. That means that if one knows that they are going up against a rewinder then it is best to bring overwhelming force and set it up so that they are completely surrounded two minutes prior to the start of combat, with everyone attempting to get a knockout. Since combat ends on a knockout and there is limited stamina then it is a monte carlo simulation where combat will happen and the odds are greatly in your favor, if your opponent moves to escape rewind, reposition some, and continue the attack. For the defender in such an attack; with multiple attackers and being surrounded and not knowing for sure how many and who is your opponent rewinder (under the likely valid assumption that one or more is), your best bet is still going to be trying to escape. If they have two rewinders it doesn't matter if you happen to be insanely good at combat, figuring out who the rewinders are isn't enough, knocking one of them and then the other isn't enough; as soon as one is down the other can rewind so that both are up again and that can be refought, so just trying to stay up and get out until they run out of stamina to bring you back. If you aren't sure who you are up against, knockout your opponent in one hit as soon as you decide to fight them. If you succeed it doesn't matter if they were a rewinder. If you fail and they weren't then fighting continues with you having the advantage, if you fail and they were, well, you are going to probably be facing a knockout punch two minutes in the past. Which leads to a question of chained rewinds: On the attacker case it isn't a problem, but in this case it is: I hit A and fail to knock out A, A rewinds and hits me 2 minutes in the past, am I now able to rewind two minutes and hit A two minutes prior to that, being 4 minutes prior to my initial decision to fight A? One way to win a fight is to get the opponent into an unwinnable situation so far in the past, that the opponents mental stamina doesn't allow it to return back to a advantageous position. (include difficult terrain, start a mechanism or some sort of counter before the fight starts, try to run away when you get advantage - dragging the combat for longer than the opponent can rewind and thus slowly tearing him down.) Think of chess and other similar games and how you can maneuver your opponent into a situation where the only possible path leads to defeat. Another way is to do a lot of bluffing, not just the mental kind, but also feigning your attacks. That way the opponent will not be sure if the deja-vu he experienced is still relevant. Take it a bit further and make the rewinders remember the actions with mathematical precision, working with a binary (hit, miss) code in their head. It might also be possible to fool the system by hitting the opponent in the same spot, but with different force, so the flashback doesn't activate. Then there is the last thing bordering on mastery. Rewind the events before they happen, before you get hit return back and be ready to block that attack. Not the answer you're looking for? Browse other questions tagged time-travel combat or ask your own question. How do I manage disease risk while time traveling? Does time-traveling drive people nuts? Comparing space combat to naval combat - Helicopters?